Wonderful Art Deco Map of Paris and the Colonial Exposition. Nouveau Paris Monumental Itineraire Pratique de L’Etranger Dans Paris. Exposition Coloniale Internationale Paris 1931. This is an extremely attractive 1931 tourist pocket map of Paris, France. Covers the old walled city of Paris and the immediate vicinity. Drawn in a lavish art deco style with important buildings are shown in profile, including the Eiffel Tower, the Arc de Triomphe, Sacre-Coeur, the Pantheon, and others. Shows both the train and Metro lines throughout the city. This map was issued in various editions from, roughly 1900 to 1937. 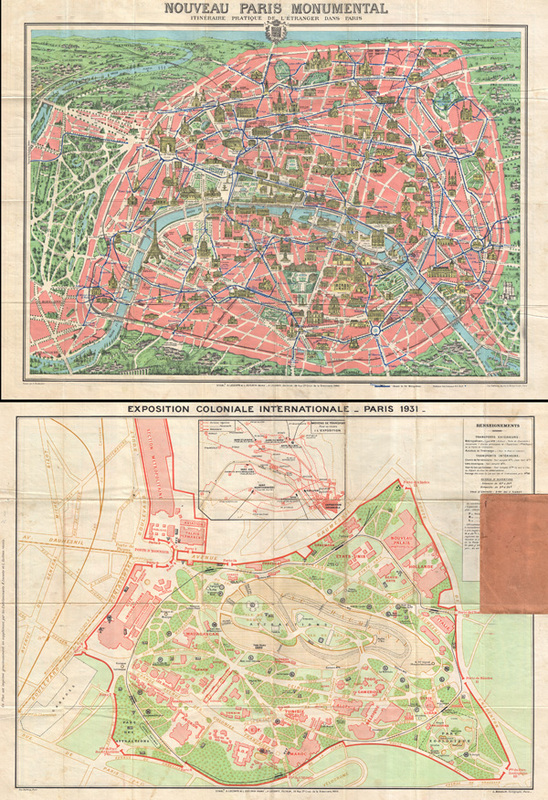 This example is exceptional in that it was issued in 1931, the year Paris hosted its International Colonial Exposition, a map of which appears of the verso. This incredible event, which was held in the Bois de Vincennes, lasted six months and drew nearly 33 million visitors. It was intended to showcase the riches and diversity of France's colonial possessions and included, among other wonders, a human zoo. Attached to original paper binder on the Exposition side of the map. Engraved by L. Poulmarie and printed by Gaston Maillet. Published by A. Leconte and L. Guilmin, of 38 Rue St. Croix de la Bretonnerie, Paris. The photo above shows both the front and back of a single sheet. Leconte, A. and Guilmin L., Plan Guilmin Nouveau Plan de Paris Monumental, 1931. Very good. Original fold lines. Map of the 1931 Colonial Exposition on verso. Comes with original binder, which is glued to verso.